The 2017-18 FAFSA is now available! It launched three months earlier than usual, on October 1, 2016. Even if your state and school deadlines aren’t for a while, you should complete the FAFSA as soon as possible because some types of financial aid may run out if you wait until the last minute to apply. To get started, go to fafsa.gov and click “Start a New FAFSA”. TIP: We recommend that the student start the FAFSA using the instructions below. It makes the application process much easier. If you are the student: Click “Enter your (the student’s) FSA ID”, enter your FSA ID username and password, and click “Next”. If you are the parent: Click “Enter the student’s information”, then provide the student’s name, Social Security number, and date of birth, and click “Next”. TIP: If you are given the option to complete a “renewal” FAFSA, choose that option. When you choose to renew your FAFSA, your demographic information from the previous year will roll over into your new application, saving you lots of time. Remember, the FAFSA is not a one-time thing. You must complete a FAFSA for each school year. Unlike the FSA ID, the save key is meant to be shared. A save key is a temporary password that allows you and your parent(s) to “pass” the FAFSA back and forth. It also allows you to save the FAFSA and return to it later. This is especially helpful if you and your parent are not in the same place. Two-thirds of precollege FAFSA applicants list only one college on their applications. For many, this is a mistake! You are allowed and encouraged to add every school you’re considering, even if you haven’t applied or been accepted yet. There is no harm in adding schools, so when in doubt, just add the school(s). You can add up to 10 at a time. If you’re applying to more than 10 schools, here’s what you should do. In this section, you’ll be asked a series of specific questions to determine whether or not you are required to provide your parent’s information on the FAFSA. These dependency guidelines are set by Congress and are different from those used by the IRS. Even if you live on your own, support yourself, and file taxes on your own, you may still be considered a dependent student for federal student aid purposes. If you are determined to be a dependent student, you’ll be required to report your parent’s information. If you’re determined to be an independent student, you won’t have to provide your parent’s information and you can skip the next step. Start by figuring out who counts as your parent on the FAFSA. For specific guidance, go here. If you are not able to provide parent info due to special circumstances, read this. Here is where you and your parent(s) (if applicable) will provide your financial information. Make sure you have your 2015 tax records handy. The IRS Data Retrieval Tool, which provides the tax data that automatically fills in information for part of the FAFSA form, is currently unavailable. In the meantime, you’ll need to manually enter your tax information. Here’s a resource to help you do that. More good news: Since the 2017-18 FAFSA requires earlier (2015) tax information, you’ll have already filed your taxes by the time you start the FAFSA. This means, you’ll be able to complete the FAFSA right away and you won’t have to log back in later to update it! You’re not finished with the FAFSA until you and your parent (if you’re a dependent student) sign it. The quickest and easiest way to sign your FAFSA is online with your FSA ID. Note: If you (the student) logged in to the FAFSA with your FSA ID, you won’t need to provide it again on this page, but if you’re a dependent student, your parent will still need to sign before you can completely submit. If you or your parent forgot your FSA ID, you can retrieve it. Make sure you and your parent don’t mix up your FSA IDs. This is one of the most common errors we see, and why it’s extremely important for each person to create his/her own FSA ID and not share it with anyone. Make sure the parent who is using his/her FSA ID to sign the FAFSA chooses the right parent number from the drop-down menu. If your parent doesn’t remember whether he/she was listed as Parent 1 or Parent 2, he/she can go back to the parent demographics section to check. If you have siblings, your parent can use the same FSA ID to sign FAFSAs for all of his or her children. Your parent can also transfer his/her information into your sibling’s application by choosing the option provided on the FAFSA confirmation page. 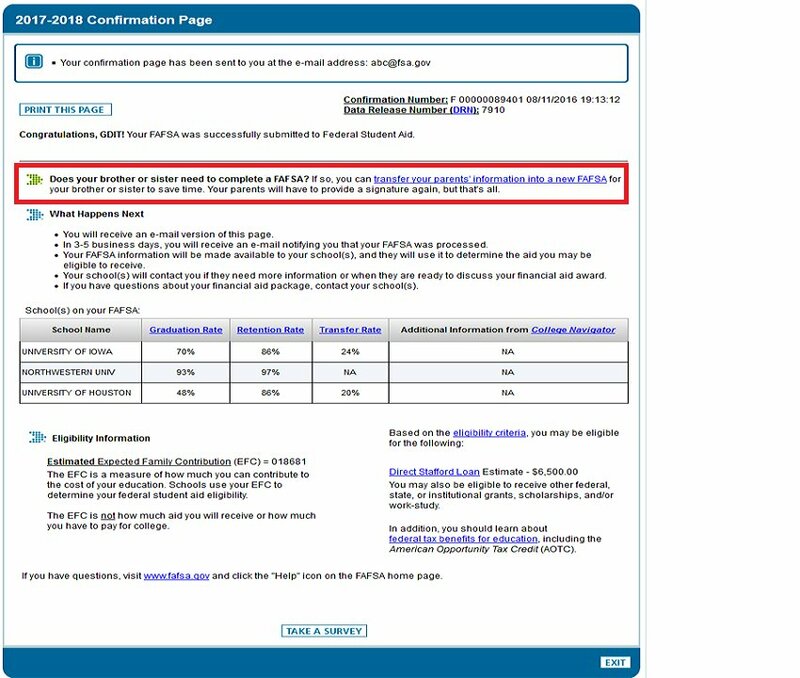 If you get an error saying that your FSA ID information doesn’t match the information provided on the FAFSA, here’s what you should do (the fourth bullet). We recommend signing the FAFSA with an FSA ID because it’s the fastest way to get your FAFSA processed. However, if you and/or your parent are unable to sign the FAFSA electronically with an FSA ID, you can mail in a signature page. From the sign and submit page, select “Other options to sign and submit” and then choose “Print A Signature Page.” Just keep in mind that your FAFSA will take longer to process if you go this route. Before signing the FAFSA, each person (student &/or parent) must “Agree” to the Terms and Conditions. This defaults to “Not Agree” and the data retrieval tool will not transfer to the ISIR. Hi. This whole process does NOT have to be as confusing as it seems. I am a college educated parent and it seems this process is very convoluted. My child has the reigns with answering parents financials and other very private family information? It seems to me that the portals between parent and child could be connected in a very easy first step in the application process on the very first page. You need to get an IT person that can make this more simple and user friendly. First screen might give an explanation about WHY the child is responsible for setting up the account. Then explain how the parent can come into the account to monitor via a separate FASFA ID and then sign the contract. Then show the two accounts LINKED on the home page!! One FASFA CHILD ACCOUNT login and then another FASFA PARENT ACCOUNT login. Showing this option would provide for a COHESIVE and LESS STRESSFUL application process. I must have called the HELP line 8 times in trying to fill out this form. THAT IS COMPLETELY UNNECESSARY. There should also be a conduit for the parent to click on to check the status of the application, on the home page. It would help if there was a MENU that allowed the CHILD AND THE PARENT to look at the different sections that were filled out to verify the information. Of course, you would not want that to be interactive. The forms themselves were long and arduous and after they were completed it would have been nice to go back and review the information. I also would like to see a simple menu for going in to viewing schools chosen and the option to select MORE schools to add to the form. NOTHING WAS VERY SIMPLE ON THIS APPLICATION AT ALL. It was not very user friendly. Thank you for your time. We will pass along your feedback, thanks for sharing your concerns. We’re always looking for ways to improve the FAFSA customer experience and having a parent login has been one request. Regarding adding a school, this can be done by clicking “Make FAFSA Corrections” but this has to be done from the student’s side (the student logs in with their FSA ID). Then you sign and submit again. This will initiate the FAFSA to send information to the new school you just added. I started the fafsa and filled out / requested the IRS retrieval tool to complete my financial info, which I was eligible for. When will I be notified that it has been completed? The IRS Data Retrieval Tool (IRS DRT) works right away. Transfer your IRS info, answer all of the other FAFSA questions, then sign and submit. You should not be waiting a long period of time for the IRS DRT to work. Hi, I easily filled out my 1st FAFSA but can not electronically sign it. It says I have the wrong user name & password. I’ve changed it and been able to confirm it’s correct on said.ed.gov. Please help! I’d love to get this done. Thanks. 1. Make sure you aren’t mixing up the parent’s and student’s FSA ID when you try to sign. 2. If you see an error at the Signature page saying your information does not match, it’s probably happening because there’s a super minor typo in your Demographic page. That’s the page with all your info, like your name, birth date, etc. What you typed in the FAFSA Demographic page has to match 100% with what you typed in your FSA ID profile page. Even if there’s an extra space by mistake, this could throw things off on the FAFSA side. Can you double check your info in BOTH places? Please, how do I add my second college bound son on the same FASFA? Or do I start a separate FASFA for him? If your second son is going to college Fall 2017, he needs to file his own, separate, 2017-18 FAFSA. Student (daughter) had no earned income for 2015; however, did get scholarships and IRS form showing what she received. Since no income, she did not have to file taxes. When the FAFSA asks about the scholarship money where is she to report it (currently reported under her name but get error message stating that the info. has to be incorrect because she has no AGI). Scholarship info was NOT submitted to parents return. My son’s 2015 tax returns are lost, we can’t find them. He tried the “link to irs”option to have the info transfer over but gets an error that something didn’t match. Who can he contact to get it straightened out? If you cannot use the IRS DRT, you’ll have to type in your tax info manually. You can request to get your tax transcript from the IRS. Can we make changes after we sign & file the FAFSA application? can I jump around and fill out parent info before the student has completed what schools to submit FAFSA to? If you ask for a professional judgement, do you only ask the school that you have been accepted to or all of the ones that you are applying to? My husband changed jobs in the beginning of 2016 and is making a lot less money than 2015. Also, if you don’t receive aid the first year and your income is much less the second year, will they award you aid beginning your second year of school? You have to ask each school if you want to compare. Each school addresses professional judgement differently. If you get into a school, they’ll create an award package for you which you can ask them about adjusting. If you do not get into that school, they will not create an award package. These factors also change every year, so even if your income has changed, there might be a situation at the school where they have less (or more) aid to disburse. The same can be said for state aid, maybe one year your state can offer more money than the next depending on their budget. My parents are non U.S. Citizens (they did not file U.S. taxes, live abroad) while I am a U.S. citizen. What tax information do my parents need to submit in this case? My 2015 taxable income was a fluke as I was covering a maternity leave and working multiple jobs so my income was substantially more than an other year. I would like to submit my 2016 tax returns. How do I do this? Sorry, you won’t be able to submit 2016 info. The 2017-18 FAFSA will ask about your income and tax information from 2015, so even though you had a higher income in 2015 you still must report that. After filing, contact the school’s financial aid office to ask for a “professional judgment” review. Explain your situation and provide any documentation you feel is necessary. The school is usually able to help if there are significant changes (like your job status in 2016) that cannot be reported on the FAFSA. What if my 2015 income was way less than 2014 tax return? I mean I (the parent) didn’t work at all in 2015 or neither did my son (thr student). In 2014 I did work a little and filed a tax return. I did already fill out the 2017-2018 Fafsa and submitted it with the 2014 tax info….what do I do? The 2017-18 FAFSA requires 2015 tax information. You can’t pick any tax year you want to report. Using 2014 income and tax info is incorrect. If you do not provide all the information required to process your application, your federal student aid will be delayed and may be denied. The one you are most financially dependent on. Our financial situation has changed, my husband is ill and only worked a few months this year. Our 2016 tax return will be less income made. What do we do next? What is the deadline to submit the 2016-2017 FAFSA renewal? The FAFSA is an annual application, so if you’ll be enrolled during the 2017-18 school year you should renew your FAFSA if you want to continue receiving financial aid. The 2017-18 FAFSA will ask about your income and tax information from 2015, so even though you had a higher income in 2015 you still must report that. After filing, contact the school’s financial aid office to ask for a “professional judgment” review. Explain your situation and provide any documentation you feel is necessary. The school is usually able to help if there are significant changes (like your job status in 2016) that cannot be reported on the FAFSA. How about if you’re a stay-at-home mom who plans to get a degree? Will I consider myself dependent student? Dependent to my husband? Will husband need to sign too? If you have a child you will be considered an independent student for FAFSA purposes. You won’t need to report your parent’s financial information. If you’re married, you’ll have to report your spouse’s financial information on your FAFSA. And no, your spouse does not need to sign your FAFSA. Hello, my name is Terrie Lawrence. My comment is more of a question. I am putting on a community event in October for the youth, teen, parents and college students at my Association which is SBA Women Education & Missionary. I am an also a Consultant who help with Student Loans Information and colleges attendance.